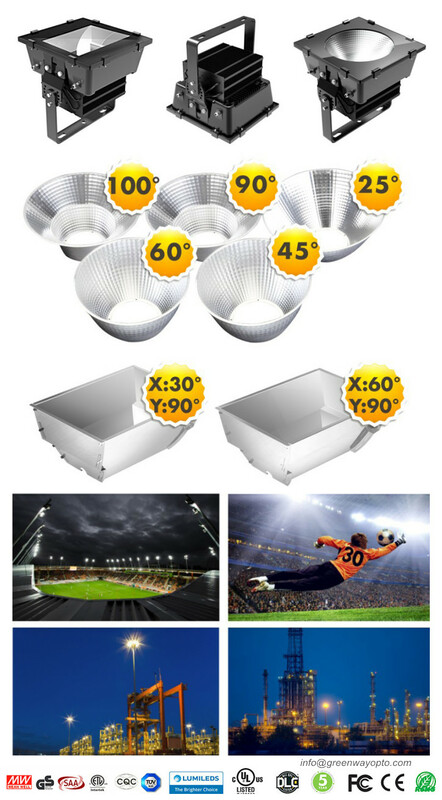 Our LED Stadium Soccer Light has been designed for Sports venues ,Square , Airport , Large Construction sites , Exhibition hall , Golf courses , Playgrounds and Other Lighting Purposes. 2.Unique Fins Heat Sink for Better Thermal Dissipation. 3.Meanwell Power Supply, Reliable and High Efficiency, 100-277VAC, 200-480VAC optional. 4.High Pressure Die-Casting Process Made this Reflector Strong. 5.It has been processed by electrophoreticpaint, and passed 200 hours salt spray test.